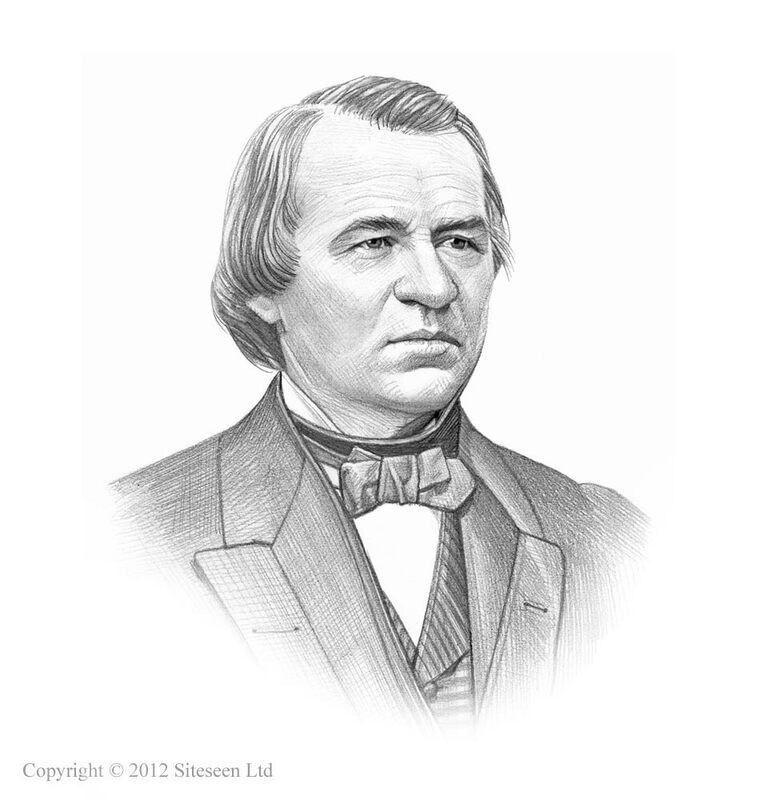 Black Codes: Andrew Johnson was the 17th American President who served in office from April 15, 1865 to March 4, 18 69. One of the important events during his presidency was the Black Codes during the Reconstruction Era following the Civil War. Summary and definition: The Black Codes were a series of statutes and laws enacted in 1865 and 1866 by the legislatures of the Southern states of Mississippi, Alabama, Georgia, Louisiana, Virginia, Florida, Tennessee, and North Carolina following the end of the Civil War at the beginning of the Reconstruction Era. The Black Codes were created to restrict the freedom of ex-slaves in the South. Black Codes for kids: What were the Black Codes? Black Codes for kids: Why were the Black Codes passed? After the Civil War and the passing of the 13th Amendment over 4 million slaves in the Southern states were given their freedom. This led to a massive labor shortage on the plantations. It also meant that southern state governments were now responsible for the ex-slaves who had previously been completely under the control of slave owners. Having left the slavery of the plantations many Black American were left without permanent homes or work. The Southerners were frightened that the freed slaves would seek revenge and feared for their families and their homes. They began to look for ways to exercise control. Some took the law into their own hands turning to Vigilantism using force to protect their lives and property which led to the establishment of secret organizations such as the Ku Klux Klan. Others wanted to maintain the legal route and began passing laws to restrict the ex-slaves new found freedom. The Black Codes included new employment laws, requirements to pay taxes and strict Vagrancy Laws with requirements for travel passes. What was the Purpose of the Black Codes? The Black Codes, that included Vagrancy Laws, led to a system of penalties and punishments including Convict Leasing that put freed slaves back into forced labor on the plantations. Who Created the Black Codes? White Southerners resented being ruled by Union military governors and officials of the Freedmen’s Bureau and the objective was to restore self-rule. In 1865, most of the old Confederate states held constitutional conventions. Only white people were allowed to vote for convention delegates or to participate in the framing of the new state governments and constitutions. The Black Codes were created by white law makers in the South in the legislatures of the states of Mississippi, Alabama, Georgia, Louisiana, Virginia, Florida, Tennessee, and North Carolina. When was the first of the Black Codes passed? The first of the Black Codes were passed in Mississippi on November 22, 1865, following the end of the Civil War (April 12, 1861 – May 10, 1865) during the Reconstruction Era. Vagrancy Laws were included in the Black Codes because of the concern that freed slaves would leave their communities and reduce the labor supply. Vagrancy Laws were offenses applied to people who were deemed to be vagrants. A vagrant was a person who, although fit to work, was without visible means of support or a permanent home and traveled from from place to place without working. The Vagrancy Laws were extremely vague and covered acts such as loitering. The Vagrancy Laws in the Black Codes allowed police to arrest people merely on the suspicion they were about to do something illegal. The Vagrancy Laws in the Black Codes meant that an unemployed, homeless freed slave could be arrested and then fined as vagrants. If the person could not afford the fine they were sentenced to county labor or hired out to a private employer. Those convicted for vagrancy and sentenced to county labor were used to build roads or railroads on chain gangs where they could be whipped by guards if they did not work hard or tried to escape. Plantation owners, or others, who wanted additional labor went to county courthouses to purchase black convicts who would otherwise work on a chain gang. The terrible treatment and deliberate harsh conditions on the chain gangs encouraged prisoners to see work on a plantation as a preferable alternative. Convict leasing was a way of moving freed slaves back into forced labor. A perfectly vicious cycle. How did Congress Respond to the Black Codes? The Republican members of Congress were outraged at the Black Codes and blamed President Johnson in part for his lenient Reconstruction polices. A Joint Committee on Reconstruction was established to investigate the situation in the South and reported that the Southern states were in a state of civil disorder, and had therefore not held valid elections. Reconstruction Acts were passed over President Johnson's veto "...to provide for the more efficient government of the Rebel States"
The response to the Black Codes by Congress brought significant political change to the benefit of the Freedmen. Most of the Southern states held new constitutional conventions in 1867 and 1868. Congress had insured that this time the ex-slaves voted and participated in the new state governments. New state constitutions were created which guaranteed the right of black adult males to vote and run for public office. For the first time in the history of the United States some blacks won election to state legislatures in the South and to Congress. By 1868, most Southern states had repealed (cancelled) the remains of the Black Code laws. The significance of the Black Codes is that they emphasized the reluctance of the Southern States to change their lifestyle after the Civil War and during the Reconstruction Era. Some of the new policies and new laws passed inflicted hardship on white Southerners and led to the emergence of unscrupulous and corrupt Carpetbaggers and Scalawags. It also led to the emergence of Southern militant groups such as the Ku Klux Klan. Whilst in operation the Black Codes effectively returned political, social and economic control in ex-Confederate states to white southerners and made clear their opposition to an equal society as intended under the 13th, 14th and the 15th Amendments of the US Constitution and the Enforcement Acts were passed during President Grant's administration. The attitude to the rights and social status of African Americans reflected in the Black Codes had to wait one hundred years for change in the 1960's and the effect of the Civil Rights Movement and meanwhile the Jim Crow Laws were enforced, sanctioned by the federal government as a result of the Supreme Court decision in the Plessy vs. Ferguson Case.